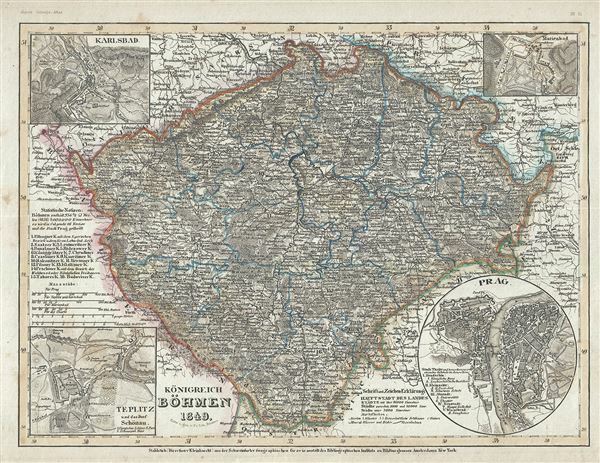 This is a beautiful 1852 map of the Kingdom of Bohemia (Czech Republic) by Joseph Meyer. It covers the territory claimed by the modern day Czech Republic, noting major towns, cities, rivers, mountains and other topographical features throughout. Four inset plans of Teplice, Marienbad, Prague and Carlsbad are included. During this time in history, the Kingdom of Bohemia was part of the Austrian Empire. The Austrian empire, founded in 1804 by the last Holy Roman Emperor, Francis II, lasted only till 1866. It was transformed into the Austro-Hungarian Empire after Austria was defeated in the Austro-Prussian War of 1866. In 1918, The Kingdom of Bohemia would be transformed in Czechoslovakia. This map was issued as plate no. 51 in Meyer's Zeitung Atlas. Although all the maps in this atlas are not individually dated, the title page and maps were often updated while the imprint with the date was not, causing confusion to the exact date for some of the maps. Moreover some maps in the atlas were taped in at a later date as an update to the atlas. We have dated the maps in this collection to the best of our ability. Very good. Minor toning and some spotting at places.